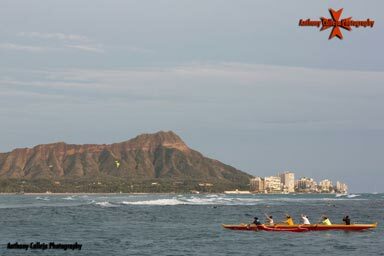 Hawaii Canoe Races Magic Island Honolulu Canoe sprint is a sport in which athletes race canoes or kayaks on calm water.Race categories vary by the number of athletes in the boat, the length of the course, and whether the boat is a canoe or kayak. Canoe sprints are sometimes referred to as flat water racing. The distances recognized by the ICF for international canoe sprint races are 200m, 500m, and 1000m. These races take place on straight courses with each boat paddling in its own designated lane. Longer marathon races do exist, notably the 5000m (also an ICF-recognized distance) - these usually have athletes starting in a large pack at a start line before paddling around a set course with marked turning points (there are no assigned lanes). For each race a number of heats, semi-finals and a final may be necessary, depending on the number of competitors.The sport is governed by the International Canoe Federation. The International Canoe Federation is the worldwide canoeing organization and creates the standard rules for the different disciplines of canoe/kayak competition. The ICF recognizes several competitive and non-competitive disciplines of canoeing, of which Sprint and Slalom are the only two competing in the Olympic games. National organizations include the United States Canoe Association, the British Canoe Union, Singapore Canoe Federation, Croatian Canoe Federation, Australian Canoeing, and the Pakistan Canoe and Kayak Federation.While an outrigger canoe may not mean much to most people, here in the beautiful Aloha State, outrigger canoeing is not only the official state team sport but a rich historical reminder that to live in Hawaii is to know and respect the ocean. No other culture in history has such a strong and intertwined existence with the ocean.Outrigger canoes first arrived in Hawaii around 200 AD, some large enough to hold up to 80 people, and were filled with essential items like edible plants, water and animals to ensure a somewhat safer voyage for the brave explorers who took off in search of land. By following the migration patterns of birds seen flying overhead, explorers soon discovered the Hawaiian Islands.￼The harsh terrain of the land, including jagged volcanic lava rock, steep cliffs, howling wind and waves, made it very difficult to transport anything, so outrigger canoes became a necessity for tasks like fishing and transporting goods and people. When native Hawaiians found giant Koa trees on the Big Island, they soon discovered they could build an entire canoe hull from a single piece of wood. While the outrigger canoe has gone through many phases over the last 2,000 years, Hawaiian outrigger canoes specifically remain built for battling conditions in the open ocean and are recognized for their unique shape, design and lack of extra ornamentation or decoration.Since setting out on the ocean was still a very dangerous and risky task, building a new canoe involved the work and dedication of many people as well as frequent cultural and traditional practices. First, a kahuna, or Hawaiian priest, had to search for the perfect site and tree by following the 'elepaio, or Hawaiian forest bird, into the forest. Since the 'elepaio was attracted to rotting Koa wood, if the bird began pecking at the tree, that meant the wood was not solid and the tree would be useless for the strong structure it took to build a canoe. Once finding the perfect tree, the kahuna would then gather the canoe builders and workers, staying throughout the building process to offer prayers and blessings.Once the tree was transported back to shore, which often required the effort of hundreds of men over several days, the hull was finished in a special halau, or canoe shed. One of the most highly honored members of the ancient Hawaiian society was the canoe carver, or kalai wa'a. Black paint, made from a mixture of plants and charcoal, was then added to the outer layer of the canoe to help keep it waterproof. For the Ali'i, or royalty, hens' eggs were used to make the paint shiny and glossy. The final act of building the canoe was the sacrifice of a dog and pig, which symbolized the tearing apart of the billows of the ocean and the rooting of the canoe into the open sea, respectively. Noho, or canoe seats, were often named after the paddler instead of the position number, and specialized wood artisans were given the task of making the paddles, all of which were customized for each owner and displayed proudly inside the paddler's home.It has been said that "canoe racing has been around as long as there have been 2 canoes." 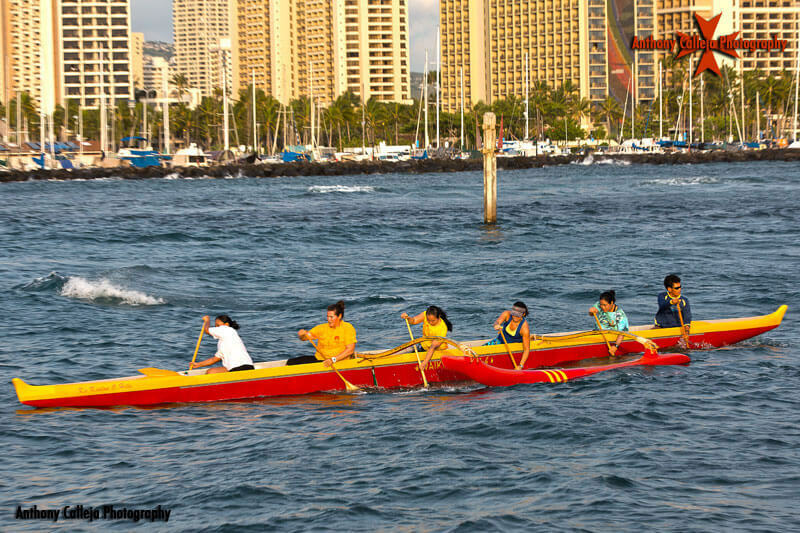 While outrigger canoes were not invented in Hawaii, the sport of canoe racing certainly was, called hei hei wa'a, and was practiced widely among Hawaiian chiefs for sport and recreation, often placing bets on the outcome. When Captain Cook arrived to the Hawaiian islands in 1779, he reported seeing at least 1,500 outrigger canoes, quite a feat due to the amount of work and manpower required to build each one. For that time, estimates of a Hawaiian population were between 175,000 to 225,000 people and between 6,000 and 12,000 outrigger canoes. 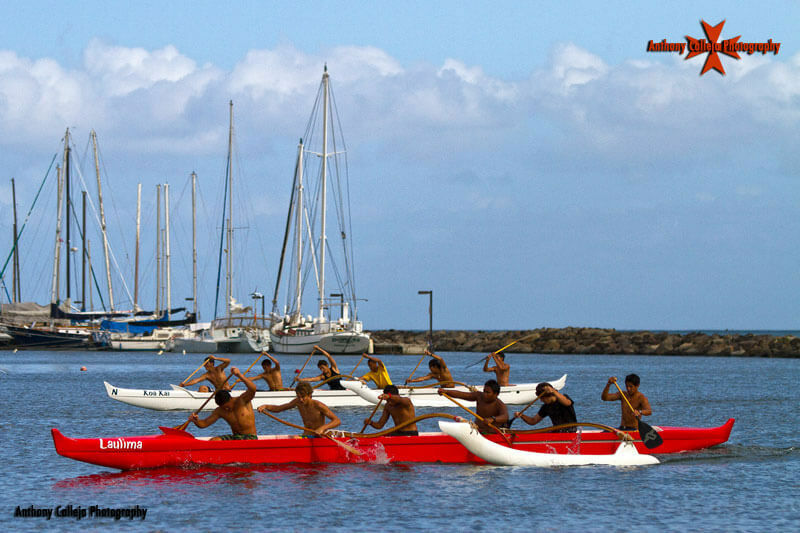 As the shift from traditional Hawaiian practices to European ways of life began to take shape, canoeing, and placing bets on the outcome of canoe races, became frowned upon by missionaries and was later banned by Queen Ka'ahumanu under their influence.Today, outrigger canoeing and canoe racing have once again been revived along with Hawaiian practices of ocean navigation and construction. 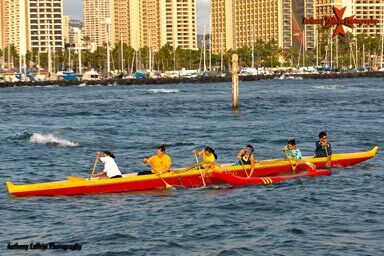 There are now more than 60 canoe clubs in Hawaii, and Hawaiian outrigger canoes are the standard canoe used internationally in outrigger canoe racing. The shape, length and weight requirements for racing are all very strict based on Hawaiian culture and tradition, commonly using original Hawaiian customs, names, techniques and traditions for all parts of the sport.While we certainly don't expect you to master the art of outrigger canoe racing on your next vacation to Maui, we do encourage you to try your hand at paddling while enjoying the views and learning something new during one of our outrigger canoe tours, which visit some of the best scenic areas on the island, including South Maui's Turtle Town, West Maui's Coral Gardens, Honolua Bay and even Molokini Crater. 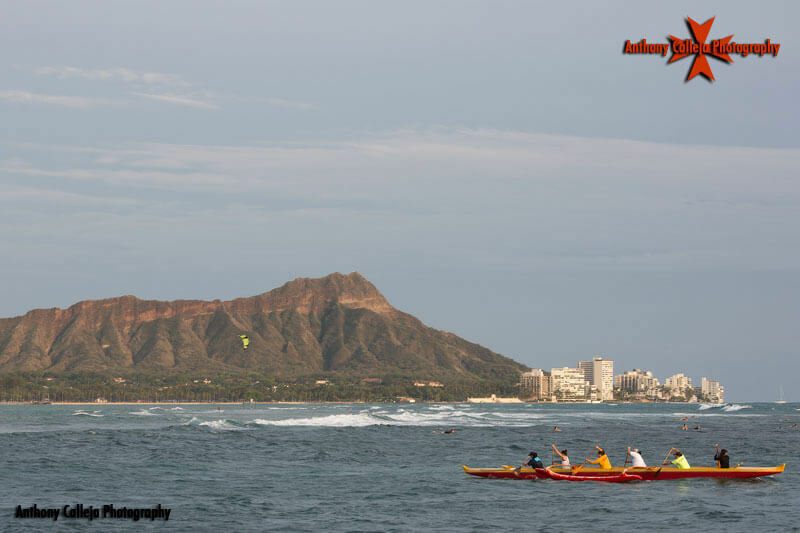 We now offer Outrigger Canoe rides on Oahu too. There are six seats in our 45 foot outrigger canoe, and while we do combine parties in order to fill up all available seats, we ensure an exclusive, private and unique experience for you and your friends or family.To learn more about outrigger canoe racing and get involved on Maui, visit Hui o Wa'a Kaulua, or "Assembly of the Double-Hull Canoe", a local non-profit organization that offers educational programs for students and is working to launch a 62 ft. transoceanic voyaging canoe called Mo'okiha o Pi'ilani, or "Sacred Lizard of Maui", later this month.